Join us for the ULTIMATE Secret Prime Time Flash Mob Event! This event is so Top Secret, we can’t EVER tell you what show it’s for and once you know, you can’t tell ANYONE until it airs two months later! We are flashing mobbing an episode of a PRIME TIME NETWORK Reality Show. The event takes place at an outdoor location in Los Angeles on March 21st and will air in early June. We’re surprising the cast with a dance to a popular rap song. 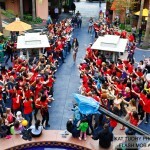 This is the first time a flash mob has ever been done that is also surprising YOU – the Flash Mob Dancers! Only serious flash mobbers need register. We need your commitment to make this thing HUGE! Let’s break our own record! We need everyone to bring at LEAST one new flash mobber! We’ll have one rehearsal on Sunday the 20th (during the day probably 12-2) so we can be sure that we are looking HOT for prime time TV! The dance is super easy so no worries if you can’t make it. You can see us on the Season Finale of Kimora:Life in the Fab Lane Sunday March 6th on the Style Network and see her get mobbed! Flash Mob America was asked to produce a flash mob for Kimora’s new line, KLS. Over 250 of you came out to dance with us! The show documents our entire process so you’ll see our interviews, auditions, rehearsals, etc. NOW PLEASE GO INVITE EVERY SINGLE PERSON YOU KNOW ON FACEBOOK AND IN YOUR EMAIL ADDRESS BOOK.